Bathrooms aren’t just practical spaces: they’re fully fledged retreats where we can re-energise and refresh yourself at the start and end of every day. As a result, bathrooms need to be beautiful, almost out of necessity. But how? The following are some ideas for how to make your bathroom more beautiful. According to Karen McCartney, a senior editor at Temple and Webster, we’re seeing a dramatic shift in tastes towards green. And when she says “green,” she’s not referring to the environmental movement: she’s talking about the colour. Emerald green in bathrooms is making a strong comeback. She says that the best place to incorporate it is around the sink, behind the mirror. Marble-effect looks good she says, as it brings out the depth of the colour. She’s also a fan of accessorizing with green towels and flannels, alongside more neutral colours like white and brown. Matching bathroom sets were once a staple of defunct outlets like MFI. Now, though, they’re falling out of fashion, at least according to interior stylist Julia Green. She says that mixing and matching are in vogue and that there’s no need to match your towels with your tiles. Her advice is to play with as many colours as you can and use Turkish towels with big, beautiful tassels that stand out. Green also says that it’s okay to add bling to shower baths. 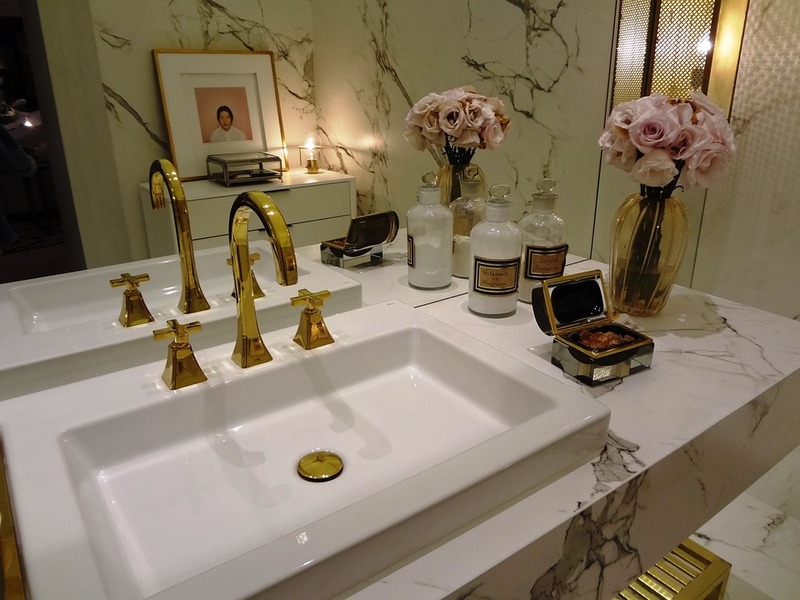 Consider gold accessories she says, as well as opulent tile work around areas that are likely to come into contact with water. As we start using our bathrooms for more and more things, a single medicine cabinet above the bathroom sink is no longer sufficient for us to keep all our stuff. Erin Gannon, an interior designer, is keenly aware of this fact. That’s why she says that all bathrooms should be built like kitchens, with specific places to put all your appliances, like your hairdryer and spare towels. Long shelving, she says, should do the trick, as well as storage space under the sink. Nothing looks worse than a sink that’s cluttered with all sorts of products with different packaging. Even if you buy top-of-the-line stuff, it rarely looks right, especially if the products themselves are leaking all over the place. Melinda Woodford, a stylist from TheHome, says that it always looks better when you keep your basin area free from clutter. Get rid of products and put them elsewhere, even if it’s in a basket on the floor. Then adorn the sink area with brightly coloured towels with beautiful patterns. She also suggests solving the problem of ugly product packaging by buying matching bathroom dispensers that fit in with the rest of the decor in your bathroom. When you buy a new product – a bottle of shampoo, for example – you can simply decant it into one of these dispensers and discard the product packaging. This is especially useful when it comes to things like hand wash and conditioner.